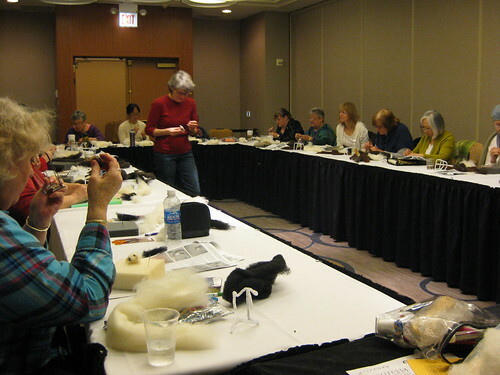 I had an all-day nuno felting class, taught by the irrepressible Judy Pascale. 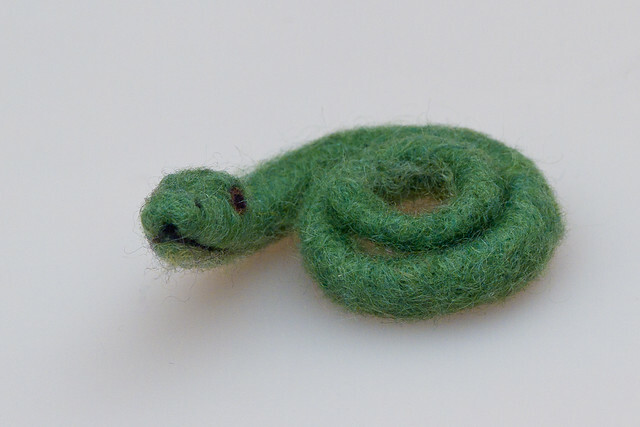 I’m not super happy with how it turned out (I think it looks like leeches, and it shrank too much!) but it’s all a learning experience, right? I didn’t even get to the market today. Oh well, there’s always tomorrow! I know I said I was done and was going to be lazy for a while then do some longer-term projects, but inspiration struck and I did a Thing-like thing this week anyway. And it was too cute not to share. 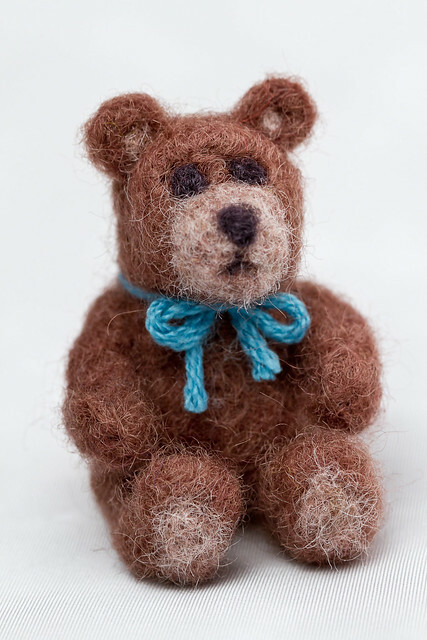 So, I give you Mr. LumpyBear, the tiny felted bear. 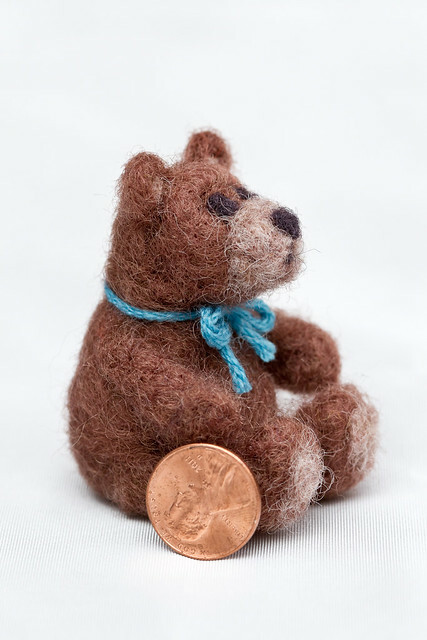 Mr. LumpyBear is needle felted using some of my dyed Romney wool, and sits at about 2.5 inches tall and less than a fifth of an ounce (5 grams). He’s a little lopsided, but how could you not love that face? 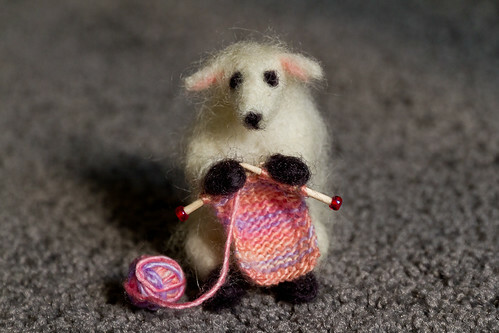 Yes, it’s a wee sheep. 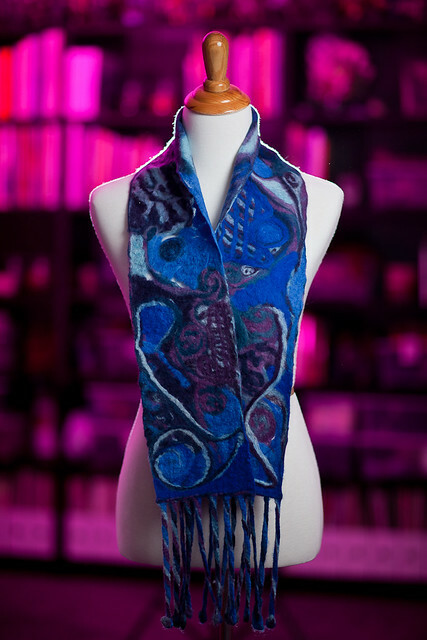 I made this for Ewenique because, well, she requested one! 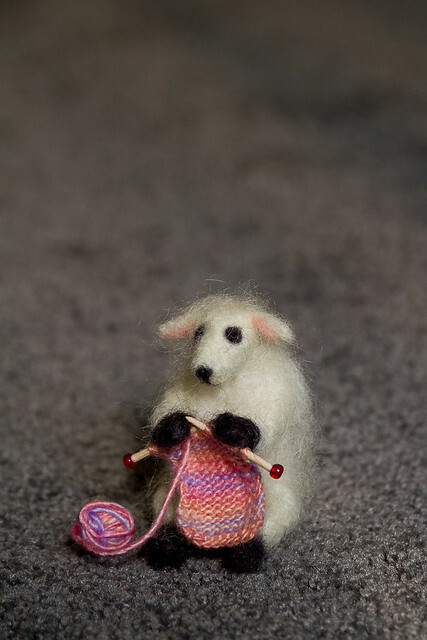 The sheep is made entirely of the Romney wool I processed last year, and I added the tiny knitting project from last week. She stands (er, sits) at about 3 inches tall. It was fun to make, if a bit fiddly because it’s so small. 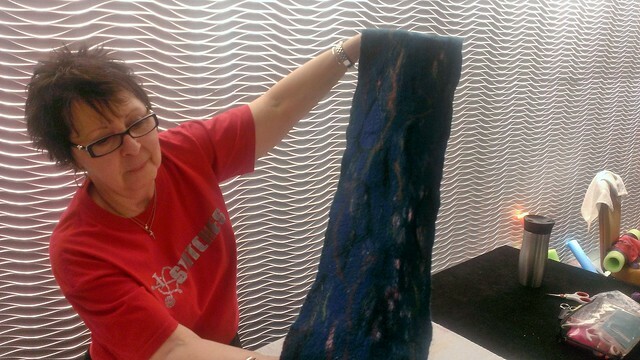 And I only bled once from stabbing myself with the felting needle this time! Go, me! Thing-a-Week is a challenge in which one produces one thing each week for a year: song, video, story, crafted item, whatever. Lots of people on the internet are doing it, and I’ve decided to follow suit. 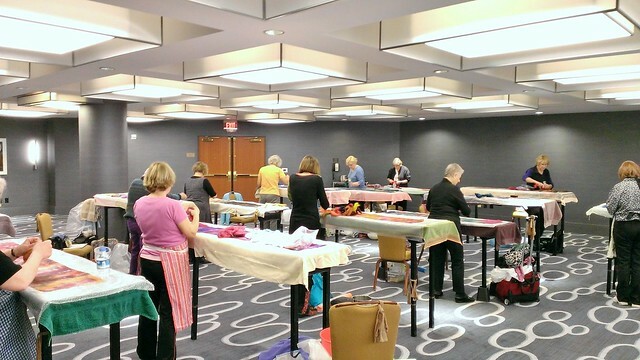 I’ll be doing mine in the realm of fiber (knitting, spinning, felting, etc. ), so every Sunday I’ll be posting some fibery thing I made that week. Could be big, could be small. Could be good, could be atrocious. Could be a part of a larger item, or a final piece. The only rule is that I have to start and finish it in that week. I have some doubts that I’ll make it a whole year, but I’m willing to give it a shot! 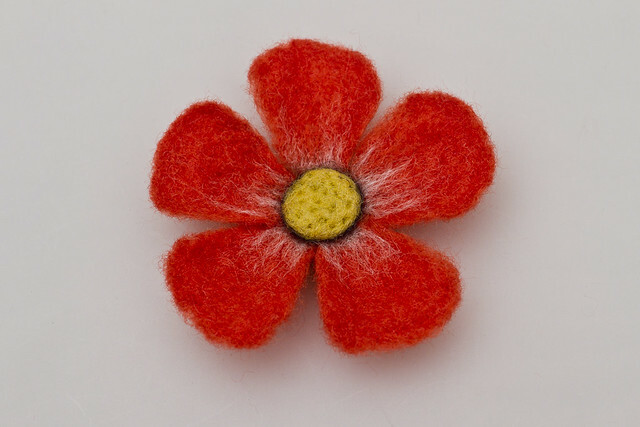 For my first Thing-a-Week, I present a needle-felted flower. 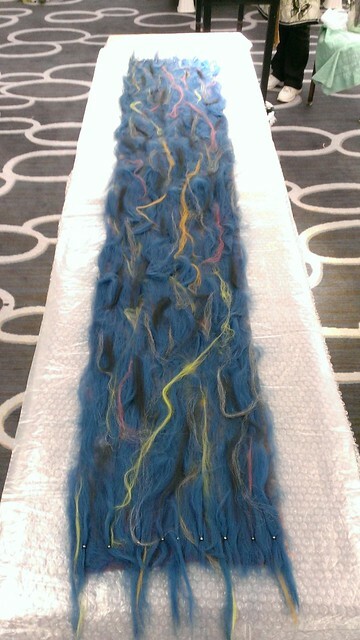 I made this with some of my carded dyed Romney fleece. My post titles are devolving. I expect my next one will be a series of grunts. 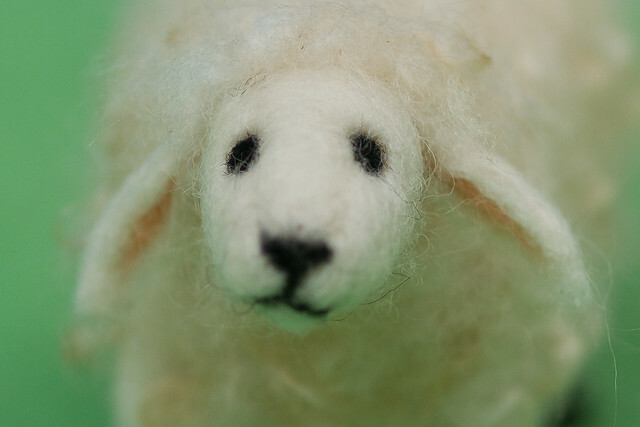 If you remember from day 4 of Stitches West, I went to a needle felting class and made part of a sheep. This week, I finished the rest! If you need me, I’ll be this puddle of goo in the corner. Well, that’s it. It’s over. It was a jam-packed, exhausting time. 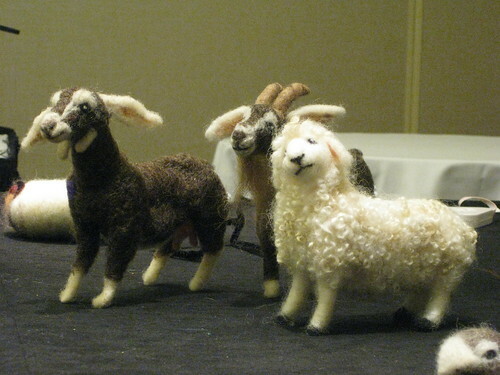 This morning I had a Farmyard Friends: Needle Felted Animals class with Sharon Costello. 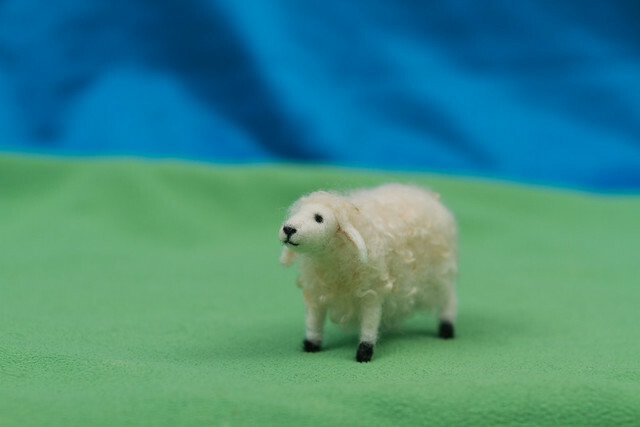 I made a sheep. 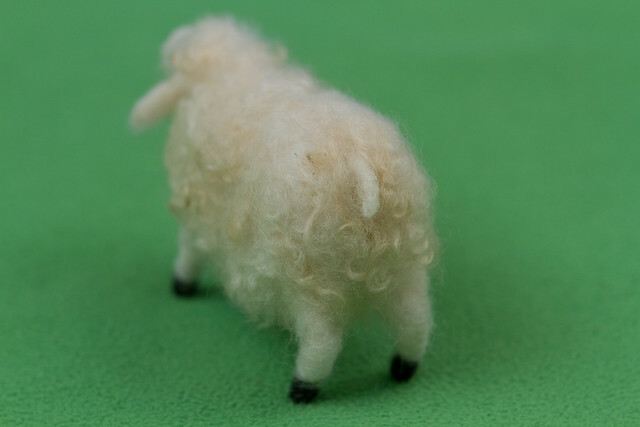 Well, most of a sheep, since we ran out of time to finish. 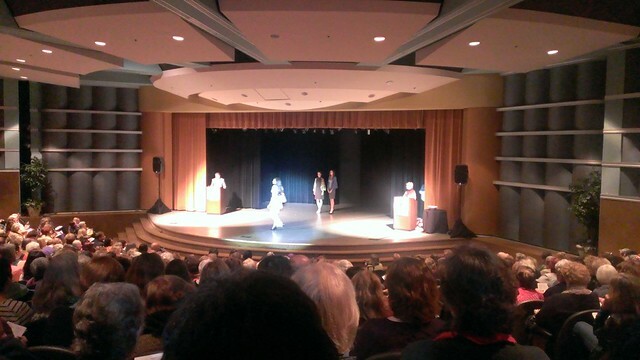 After class, it was back to the market for last minute stuff and the grand prize drawing. Nothing really grabbed me except a couple of dizzes and buttons, and I didn’t win anything. What a drag. Sherry was kind enough to drop me at the airport for my flight home, so here I sit, waiting for my flight. I’m completely worn out, but I had a wonderful time. Thanks to all my great Northern California friends, you made me feel a part of the family. See you next year!